This imposing building, described by Prosper Mérimée as “a summary of medieval art”, stands at the very end of a rocky plateau overlooking the four rivers of Cère, Bave, Mamoul and Dordogne, at the northern edge of the province of Quercy. The château, which in the words of Pierre Loti is a “serrated structure made from blood-coloured stone”, overlooks a small castle town with records dating back to the 13th century. The town’s main feature is the Saint-Louis collegiate church, built by Jean II de Castelnau-Caylus in the early 16th century. 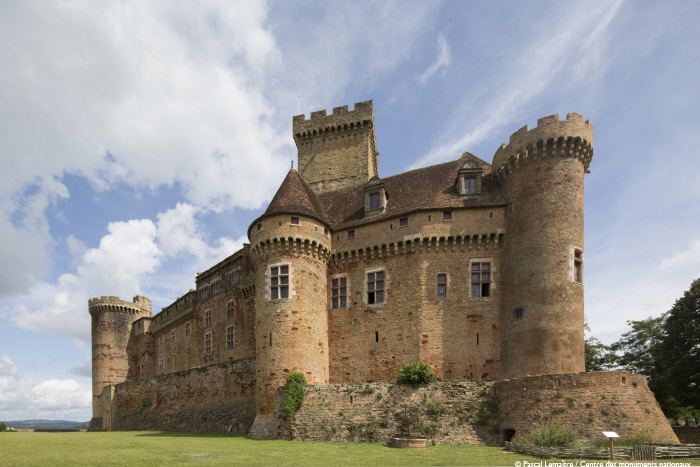 The Barony of Castelnau, which sits between the Viscounty of Turenne and the County of Auvergne, was part of the County of Toulouse from the 11th century onwards. The barony was mentioned in the records of the Abbey of Beaulieu sur Dordogne from the 8th century onwards, and the first new château was built there in 1100 by Hugues, then Gerbert, then Gerbert II, Bishop of Cahors. After a series of feudal battles with the Turennes, the Castelnaus established a direct relationship with the Kings of France in 1280 (Philip II the Bold, then Philip IV the Fair in 1308). At the time, Castelnau was a strategically important location. The residential tower and the keep were built in the 13th century from red stone and ochre. They still dominate the site today. The family went on to climb through the social hierarchy, first through its alliance with the Calmont d'Olts, lords of Espalion and St-Côme en Rouergue, then through the marriage between Hugues de Castelnau and the niece of Pope John XXII in the early 14th century, and finally through an alliance with the Caylus family in the 15th century. In 1530, the heiress of the Castelnau-Caylus family brought the barony into the Clermont-Lodève line. In 1715, the title and lands passed to Baroness Jeanne d'Albert de Luynes, then to the Dukes of Luynes in 1756. The Luynes finally sold the château and the grounds in 1830. Additional constructions were added throughout the 14th, 15th and 16th centuries, under the ownerships of the Barons of Castelnau, Jean II (chamberlain of Louis XI) and Jacques, who served under Louis XII during the Italian Wars. It was at this point that the château’s configuration was almost finalised, with the addition of three dwellings complete with towers, plus an imposing artillery tower. The entire property was protected by low outer wall and moats. There was originally a third outer wall surrounding the entire town, but only a fortified door and a few other sections of the wall remain. The dwelling added to the residential tower in the 14th century includes the château’s chapel, which opens out onto the internal courtyard via a large, Gothic door. Consisting of two vaulted cross-beams with intersecting ribs, it was entirely painted with scenes of the Passion and the Resurrection, but only a few remnants remain. However, the majority of the woodwork and the Gothic furniture remain intact, including the stunning, multi-coloured altarpiece. Dating from the same era is the gatehouse, with a passageway above which stands a high-vaulted room with fine beams that lead to elegant capitals with leaf details. The eastern and northern dwellings, added in the 15th century, enclose the interior courtyard, forming a general triangular shape. In line with technical developments, the late 16th century saw the addition of covered bunkers equipped with arrow chambers, as well as “French style” fortified cannon ports. These additions strengthened the defences of the towers and curtain walls, making the château more hazardous for approaching assailants. The Clermont-Lodève family (and especially Alexandre) commissioned extensive work throughout the 17th century, transforming the previously austere fortified castle into a luxury residence, complete with large doors and windows, a grand balcony overlooking the valley, and a large arched gallery that played host to celebrations and festivities. The château was visited by poet François de Maynard, and was a regular haunt for the Capitouls from Toulouse. Their descendants lost interest in Castelnau, instead preferring their Parisian mansion and their château in Clermont (now Clermont l'Hérault). Meanwhile, their holdings in Quercy continued to provide a steady source of truffles, as stated in the farm leases from 1782. The gatehouse and drawbridge defences were removed in 1793, and the château was partially dismantled and its archives pillaged. The château narrowly avoided total demolition in 1844, following the intervention of the Prefect of the Lot and Inspector Calvet, from the recently created Commission des monuments historiques. Sadly, the château fell victim to a devastating fire in early 1851, which destroyed the vast majority of the 17th-century buildings. The ruined property was classified as a Historic Monument in 1862, and was finally purchased in 1896 by its ultimate saviour, Jean Mouliérat, a tenor with the Opéra Comique in Paris. He devoted his fortune and energies to restoring the château, as well as redeveloping and furnishing the interior. He introduced a vast and diverse collection of furniture, paintings, tapestries, sculptures and pieces of art from across the eras, as well as a remarkable collection of stones. Jean Mouliérat was an artist, art lover and humanist. His guests at Castelnau included Rodin, Colette, leading figures from the worlds of politics and culture, and Ranavalona III, the last queen of Madagascar. He passed away in 1932, after donating the château and its collections to the State with the assistance of his friend, Minister Anatole de Monzie. In accordance with his wishes, the apartments that are now open to the public house the entire collection of furniture and pieces of art, laid out and selected personally by Jean Mouliérat.